In the world of printing custom stickers, there are two popular methods including spot color printing, and full color printing. The main difference in these two methods is in how the ink is applied during the printing process. Spot color printing is a traditional method where the colors of your design are applied individually in layers, eventually filling in all of the spots in your custom design. Full color printing is a digital method where all ink colors in your design are printed at the same time. This allows for full color matching, and a wider range of color blending abilities on custom stickers printed with this method. 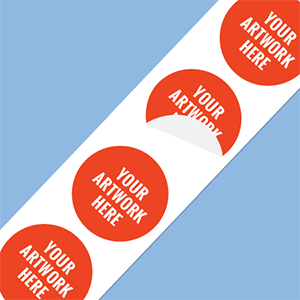 With spot color printing the elements of your design are printed in "spots", one color layer at a time, to form a complete design for your custom stickers. 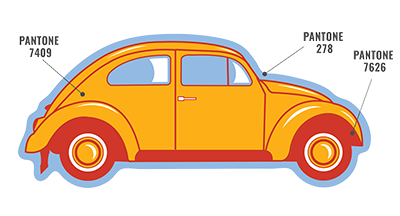 Standard spot color printing for your custom stickers allows for up to four colors in your design, but more colors can be added if your design has more than four colors. 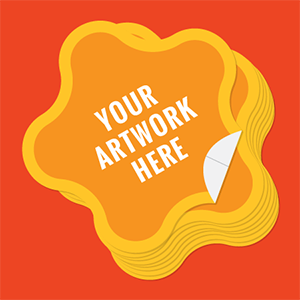 Just let us know and we'll be happy to help you with a custom quote for your artwork. In this method of custom sticker printing, each spot color will be applied to a unique area of the sticker, and colors are not generally blended to create more than the chosen color variations within a single printed design. If your design has a single color, this would be considered a one spot color printing. Single color designs, or designs with shades of a single color look great with one spot color printing. For designs with shades of a color, we will work with halftone dots to represent these areas in your design, giving your custom sticker a shaded appearance. As you add more colors to your design, the number of spots you add increases as well. For example, if your design has three separate colors, then your design would be considered a three spot color print. Adding to this, if your design has four colors, this would be considered a four spot color design, and so on, for the total number of colors to be printed in your design. All of the inks we use are based on the Pantone Color Matching System, also known as PMS colors. This system is simply a universal color matching system to help us get 100% accuracy when matching the colors in your design to the inks in your stickers. 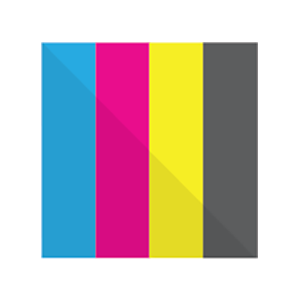 When printing in spot color you can choose from our standard StickerGiant Spot Colors, shown on our Ink Options page. 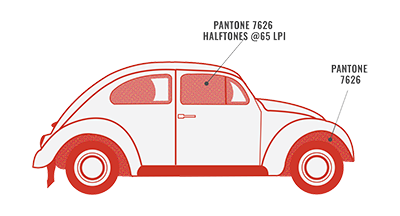 If your sticker requires a custom color option you don't see in our standard ink selections, we can also match your Pantone colors with exact accuracy to your design. You can learn more about how we match colors for spot color printing, on our color matching page. Keep in mind, using a standard ink option is a bit more economical, since we won’t have to specially mix colors for your custom sticker design. When working with multiple colors in your design, it's also important to have each color in your artwork setup as its own layer in the file you send our way. 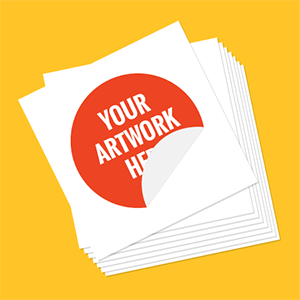 Each layer in your artwork will then be printed to combine the colors of your artwork, and form the complete design of your custom sticker. You can learn more about how to setup your artwork for Spot Color Printing on our Artwork Page. Spot color printing is the method of choice for vinyl stickers, such as the material used in our Silkscreen Stickers. When working with designs that only have one color, spot color printing can also be an economical choice, while still giving you a quality custom sticker. This method of printing also makes it possible to use specialty inks, such as metallic or fluorescent in your design. Inks applied in a spot color printing process also tend to go on thicker, making these stickers extra durable, even in outdoor elements. Silkscreen Stickers printed with spot color are available with custom shapes for a small additional charge because we will create a unique die to cut the custom shapes of your stickers. Full color printing is also referred to as digital, process, CMYK, or four color printing. All of these terms refer to a digital printing process that works with the four colors of cyan (C), magenta (M), yellow (Y), and black (K). 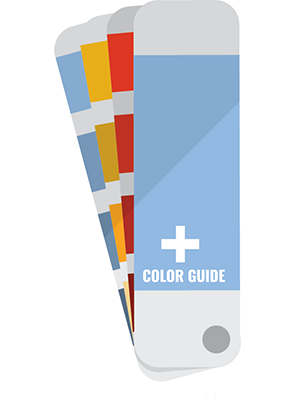 Blending these four colors in varying amounts of each color, can achieve thousands of color options in a single printed design. These stickers are also printed on a digital press, allowing more flexibility in your design details and variations of color options you can include. With full color printing, Inks are applied to the sticker material at the same time, rather than one layer at a time as with spot color printing. Full color printing can be done with custom stickers, and is also a preferred method of printing custom product labels for the inticate details it can offer. Full color printing is ideal when you have complex color variations in your artwork or need a wider variety of colors in your design than what can be achieved with spot color printing. Our Die Cut Stickers are printed in full color on our digital printing presses. Show off the details of your designs, with an easy to share sticker with a crack and peel backing so all you see is the sticker! Kiss Cut Stickers are an excellent option when you want your designs printed in full color, and still want a small amount of backing to appear around your custom sticker design. A small amount of backing is also helpful when you plan on stacking your stickers, or they have a delicately designed edging in the custom shape. Clear, Matte, and Glossy White Labels are also digitally printed with full color. When you want the label you apply to your products to look as good as the product itself, our label options with full color printing are just what you need.